This post was originally going to be one of those fire and brimstone, you better critically evaluate yourself blah blah blah blah posts. But this morning, I don’t feel like harping on a perfectly constructed inspirational theme. Sometimes having a draft list of a billion posts is useful, but for some reason this topic is clogging up the pipeline and I’m having difficulty posting anything until this gets out of the way. So, today I present the idea – draw your own conclusions. Here was the inspiration in a nutshell – In my lesson on Tuesday morning, my trainer had to get a bit short with me. I couldn’t get Zach round. I felt like I was doing the same thing over and over (which inside my head matched what she was asking) and the results didn’t change, which is the very definition of insanity. I said something to that effect, and she said something like I was talking too much in the lesson and not allowing her to tell me what to do in our allotted time slot. And you know what – she was right. It’s not fun to hear criticism. And sometimes because of circumstances, that feedback isn’t constructed in the most “constructive”, “polite” way possible, and sometimes you might even think “that’s not fair!”. And guess what. It probably wasn’t totally fair because of what ever cirucumstances you can drag up to justify why you did it THIS time. Doesn’t matter – it’s still true. Maybe the feedback could have been “phrased differently”. Oh well – because it doesn’t make their feedback any less true. And maybe, just maybe, because it stung a little, THIS time it will sink in. And finally, THAT might have been what you needed to get to the next level. And of course, when I use that all-too-easy-avoidance word “you”, I really mean “me”. Are you having trouble getting to the next level in your chosen discipline? Are you having trouble moving up to 50’s or 100’s? Or maybe even completing LD’s consistently? OK, I may have lied. Now that I’m into the post, I’m perfectly willing to go on harping on the topic. Now I present, more use of the word “you”, where the word “me” and “I” probably should go! 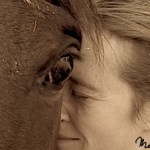 Do you have anyone in your horsey life that is willing to be frank and honest with you? Sometimes it takes some frustration in order for a person to be honest – I know I don’t like hurting people’s feelings, and sometimes I give the most honest feedback when I’m a bit grumpy and tired. (I know, probably something I could work on….). But likely, if I do blurt something out, it’s likely to have been on my mind for a while and while the comment may be said on the whim of the moment, often the feedback itself was not pulled out of thin air of the moment. If the feedback stung, take a minute to evaluate whether it was because it was particularly true. Swallow your pride, bite back your words, and force yourself to listen and reflect. You may have been given a gem in the rough, that with a bit of polishing could take you to the next level and beyond. If you are not disciplined – and everyone undergoes discipline – then you are not legitimate children at all….No discipline seems pleasant at the time, but painful. Later on, however, it produces a harvest of righteousness and peace for those who have been trained by it. Most of you probably recognize where this came from. I’ve tried to remove most of the direct references to God in it, so the point I’m trying to make in reference to riding comes through clearer. Although discipline (Let’s call it “honest feedback”) is mostly painful…..one thing that is proved is that the person CARES, and assuming that feeling isn’t hate that could motivate false hurtful feedback, considers you one of their own. Someone that smiles and nods as you bumble your way down the wrong path isn’t necessarily your friend or a trainer that considers you part of their team. My trainers motivation is to make me the best dressage rider she can in a very short amount of time. In a nutshell I’m skipping an entire year of training, we don’t have time for me to gently figure out what I’m doing wrong. I need to create new neuro pathways NOW to learn the material NOW and be able to execute it in the show ring in 3 weeks. There is no time for her to figure out the best and most “constructive” way to tell me something and have some heart-to-hearts. If this is going to get done, anything that is holding me back needs to be addressed with swiftness and honesty. And I don’t have the time to feel hurt or offended if I want to perform well at Pebble Beach. There’s not a lot of trainer/coaches in endurance, at least in the formal sense like there is in dressage. It can be hard for the newbie. At a dressage show I can ask for advice after a warm up in the ring and get very specific comments about what needs improvement, without a lot of regard for my “feelings”. At an endurance ride, much of the advice is tempered and it can be very very hard to get the people who should be giving advice to give it! They don’t want to waste their time giving advice that won’t be followed. They don’t have the time/energy to coach their advice so it won’t offend, they don’t want to scare away newbies or appear “unsupportive”. I quickly learned that the people giving the most and “loudest” advice weren’t always the people I necessarily should be listening too… I think, on the whole, endurance is full of independent, intelligent people, whom the attraction of endurance is partly that we can march to our own drum. Unlike dressage where there seems more black and white and less grey, endurance is awash in a sea of grey that leaves much to the rider’s interpretation. However, I think much can be gained by critically examining how you react to honest, not-so-polite criticism, and whether it is holding you back. Posts should come more regularly. I’ve figured out that anything that needs to be done for ME on my own time (like running, blogging, writing) needs to happen in the morning. So instead of frittering away the best part of my day (early morning) doing housework and then laying in a stupor the rest of the afternoon, blogging will now happen first thing after devotions, and before walking the dog and going for a run. Know thyself…..